At the time of independence, British India was divided on the basis of religion. However, the princely states, on the other hand, were not divided. They were to go, each state as a whole, to either India or Pakistan. The decision of where to go was to be made by the erstwhile ruler. In the case of J&K, the ruler Maharaja Hari Singh made the decision to accede to India. But to the contrary, most leaders from Kashmir have built a false narrative to mislead the nation & strengthen their credentials as nationalists that the decision of accession with India was taken by Sheikh Abdullah and other Kashmiri leadersand maintain at the same time that accession was conditional. It is a well- known fact that Sheikh had set his eyes at the throne of Jammu & Kashmir with the blessings of his friend and mentor Nehru. He wanted to be sole representative of the people of J&K and rule the state as the undisputed ahead of a “single party state.” He abhorred opposition within the party or outside. He behaved more like an autocrat than a democrat. However, many other popular Muslim leaders who were non-Kashmiris posed a challenge to Sheikh’s ambition. He ensured that they were marginalised by so managing the ceasefire in 1949 immediately after the Valley was liberated but large parts of Jammu and the frontier areas of Gilgit- Baltistan continued to be under the occupation of Pakistan. This way Sheikh eliminated the threat posed to his supremacy by Pahari, Punjabi and Dogra Muslim leaders of the state. He also isolated Shia leadership by allowing the frontier areas to remain under Pak’s occupation. Sheikh killed two birds with one stone. He not only ensured his singular dominance in the politics of Kashmir, he also ensured that pro-Pakistan leadership was isolated. It is evident that the Sheikh harboured political ambitions and wanted to use the issue of accession as a bargaining tool with the Indian Government so that he could rule an “autonomous state” under the patronage of Nehru ruled India. The Interim Government was instituted by a proclamation made by the Maharaja on 5 March, 1948. A Council of Ministers with Sheikh Mohammad Abdullah as the Prime Minister was constituted to conduct the administration of the State. The Council was to function on the principle of joint responsibility. The dual government did not took long to run into trouble due to their divergent views which followed diametrically different directions. The National Conference soon got engulfed with internal politics forgetting the interest of the people. The dual government came to a tragic end. Sheikh with the active support of New Delhi succeeded in marginalising the Maharaja, who finally relinquished his office on 9 June, 1949. On June 20, 1949 by a proclamation the Maharaja announced his decision to abdicate the State on grounds of health and investing all his power to his son, Yurvaj Karan Singh.Had Karan Singh refused the regent ship and decided to stand with his father, Sheikh’s move would have failed pre-maturely since J&K was still ruled under ‘Jammu-Kashmir Constitution Act 1939’ and all constitutional powers vested with the Maharaja only. The people of Jammu region were apprehensive of the pro-Kashmiri Muslim and anti-Jammu mind-set of Sheikh. An agitation against the Sheikh was launched in Jammu under the banner of PrajaParishad, an opposition party, formed in Jammu in November 1947. The main objective of the PrajaParishad was to achieve full integration of Jammu and Kashmir State with Indian Union, like other states and safe guard the legitimate democratic rights of the people of Jammu.Sheikh dubbed the opposition from Jammu as “communal”. Sheikh began to believe that Kashmir’s aspirations could not be met within the Indian Union. On the other hand Jammu &Ladakh clamoured for complete merger with India. Emergence of Kashmiri identity led Sheikh to start differentiating between ‘Muslims and Non-Muslims of the state’. It became imminent that his agenda evolved around ‘Independent Kashmir’. After initial bonhomie, Sheikh started showing his true colours which forced Nehru to order his arrest in 1953. Similarly, the narrative regarding Article 370 that it is not temporary but permanent provision of the Constitution of India and acts as a bridge between the state and rest of India is also a concoction based on twisting of facts. The fact is that Sheikh Abdullah manipulated its inclusion in the Constitution due to Pandit Nehru’s blind love for him. It is a well- established fact that when the rulers of the Princely states signed the Instrument of Accession and joined the Dominion of India, they surrendered legislative, judicial and executive control of three subjects – Defence, Communication, External Affairs and Ancillaries. The same is true in respect of the Maharaja of Jammu & Kashmir as well. This implied that the princely states would have the right to decide upon policies, implementation and administration with regard to other issues, through such arrangements as Royal Proclamations or a separate Constitution for their respective kingdoms/states. Instead of doing so they expressed their faith in the under draft Constitution of India through its full applicability to their respective states, except Jammu & Kashmir due to manipulations of Sheikh. Thus, when rest of the nation was readying to adopt the Constitution of India, there was a constitutional vacuum in the state. To fill this vacuum Article 370 was inserted in the Indian Constitution, in the hope that J&K would, once the situation normalises, integrate like other States of the Union (hence the use of the term “temporary provisions” in the title of the Article). Another myth created by a few Kashmiri leaders is about merger against accession. While Indian Constitution was being drafted to pave way for the nation to become a Republic from a Dominion, all other princely states individually or collectively decided to accept the paramountcy of the new Constitution of India, Sheikh Abdullah harboured different ideas. These states sent their representatives to the Constituent Assembly and were thus actively involved in drafting of the new Constitution, which implied that they willingly joined the Republic of India and the Instrument of Accession signed by them (a uniform document signed by all 565 princely states) became redundant. This also sorted the issue of merger and no separate ‘Instrument of Merger’, as claimed by a few, was signed by them. The fact is that Karan Singh exercising his powers as the Regent of the state did send a four-member team comprising Sheikh Abdullah, Mirza Afzal Beg, Moti Lal Baigra and MaulanaMasoodito represent the state in Indian Constituent Assembly. This was in tune with the other princely states and signalled the will of being the part of Republic of India surrendering the Instrument of Accession, which also meant the “merger”. It is a different story that the four taking advantage of the prevailing security and political instability in the state decided to sit out and not join the Constituent Assembly of India. Sheikh Abdullah, thus, cleverly gave shape to his ambition of capturing the throne of Jammu & Kashmir much against the wishes of 2/3rd of State’s population comprising the Jammu &Ladakh regions and non-Kashmiri speaking Muslims of Kashmir and the Shias of Kargil. In this, he enjoyed the full support and confidence of Pandit Nehru. 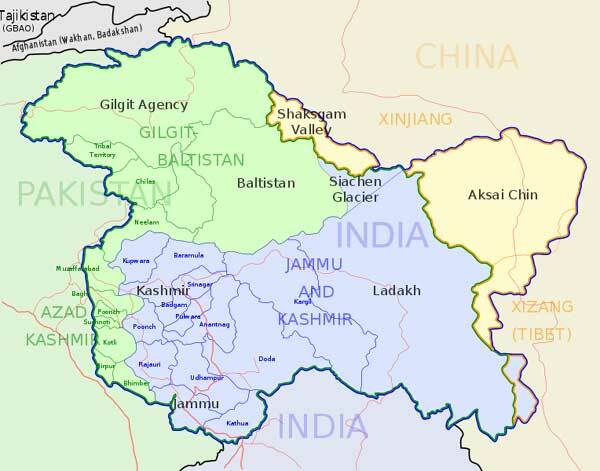 Though J&K has been declared an integral part of India both by the State’s and the Indian Constitutions, Kashmir based political leadership continues to question the accession/merger on the pretext of Kashmiri identity ignoring the sentiments and aspirations of the people of Jammu &Ladakh and encouraging “separatism”. Its not Pakistan, Its Kashmir…!